Would you live in a 400 square foot apartment? Our friend Joe Minicozzi at the geoanalytics firm Urban3 gives presentations around the country sharing deeply valuable data on which development patterns benefit cities and which do not. 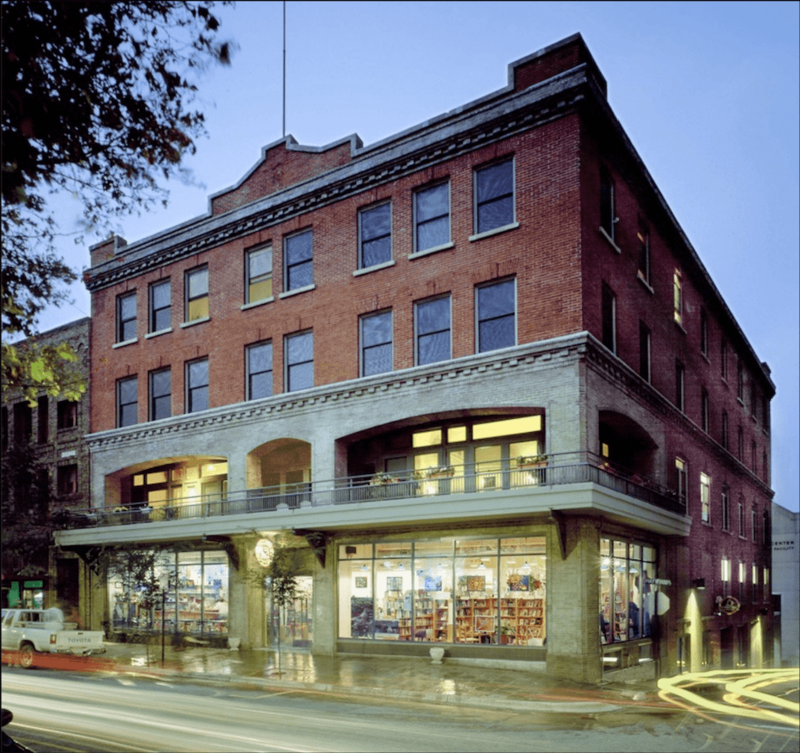 In some of these presentations, he likes to share an example of a real estate developer who, back in 1994, chose to fix up an old hotel in downtown Asheville, North Carolina and convert it into small apartments with a store on the bottom floor. Joe explains that there are three real ways to provide affordable housing: 1) Get an incredible real estate deal, 2) Get it subsidized by a government or nonprofit entity, or 3) Build smaller, no frills homes. This downtown Asheville development went the latter route. The apartment units were 400 square feet each so they could be offered at a cheap monthly rent. The bottom floor is a bookstore and upper floors are full of small apartments. The top floors went completely unused for many years. When Joe presents this project for audiences of elected officials, business people and city leaders around the country, there's typically a reaction along the lines of: Who would live in a 400 square foot apartment? How could they possibly rent these units? It's at that point that he asks the audience: Okay, do any of you live in a 400 square foot apartment? Sometimes a few people raise their hands, but usually not more than one or two. When you're talking to a room full of suits with six-figure household incomes, the idea of a 400 square foot apartment seems ludicrous. They can't imagine anyone living in it and therefore, they don't create the circumstances for it to be built. The local building codes won't readily allow such a small unit, but the city staff and elected leaders don't think twice about it because they can't conceive of a 400 square foot lifestyle. Meanwhile, the bankers don't make financing available for a project like that because, of course, none of them live in 400 square foot apartments, and for the developers, it's the same story. That's why in Asheville, a city of 90,000 people, there were hardly any small apartments available downtown at the time that this building was redeveloped (and there still aren't many today). But when a room full of powerful people starts reflecting back on their lives, they recognize the specific prism through which they're viewing things. "Sometimes we go into decision making thinking about where we are in our lives," Joe explains. "We take our biases, and assume that needs to be the standard or the rule." This is a serious mistake, though. Now, I know there are people reading this who are thinking to themselves, "I live in a 400 square foot apartment right now and it's great." I myself lived in an apartment about this size a few years ago. But unless you reside in a large city where housing options are extremely tight, this is probably not the norm. So those of us that are happily enjoying affordable small apartments need to make our voices heard and share with those in power that these units work, and that they provide very necessary housing at a reasonable price. And if you're a banker, a developer, or a local government leader, stop viewing your city only through middle class and middle-aged eyes. Just because a particular form of housing looks utterly unappealing to you at this point in your life, it doesn't mean there aren't plenty of residents who wouldn't gladly live there if it meant an affordable monthly rent. We miss out on so many opportunities to provide housing for people because of this prevailing elitist mindset which says "No one would want to live there!" In fact, there are plenty of people who, when faced with a choice between spending most of their income on housing, or moving in with relatives, or even becoming homeless, would much prefer a small apartment over any of these options. In downtown Asheville, this apartment building is still flourishing with a waitlist for units to this day. The downstairs bookstore has been successfully doing business for decades and a restaurant which opened in the basement 15 years ago is frequently crowned the "most romantic" restaurant in the city. When we stop basing our local decisions on what we assume people need and want, and start thinking about all the possibilities available, we can create far more economically viable options for housing and businesses. If young urbanists are serious about moving back to the city, maybe they ought to consider more of the city to live in.